Florida medical power of attorney, also referred to as the “Health Care Advance Directive” and “Health Care Surrogate”, consists of a living will and a surrogate designation. 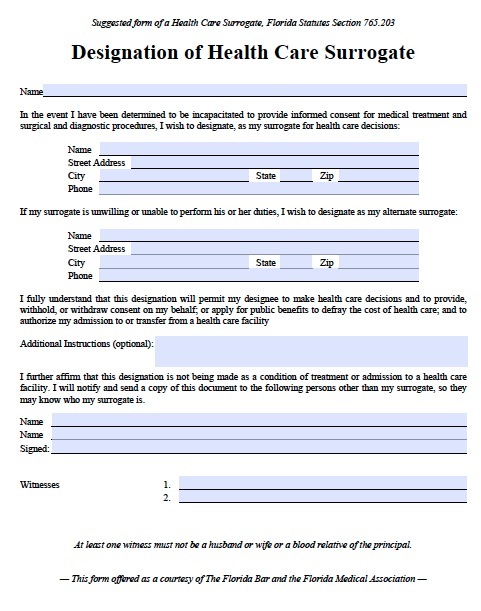 Similar to the other power of attorney forms, a surrogate designation enables you to name a representative to make decisions for you if you are incapable of doing so, for example, if you have Alzheimer’s and cannot understand your physicians or communicate with them. If you do not have these documents in place, your loved ones and physicians, or perhaps even a judge, would have to decide how to treat you or whether to discontinue life-supporting treatment if you are in a persistent vegetative state. But with the directive, you can be assured doctors will treat you according to your wishes. Options include ordering healthcare personnel not to resuscitate you, or not to continue life-sustaining treatments like artificial hydration, or you can require that any of these treatments be administered indefinitely. In Florida, preparing a health care directive does not require an attorney, but it may be helpful to consult one. You may change or terminate the directive at any time. You can do so simply by writing a new one, signing it, and dating it, or by destroying the old one. Florida also honors health care directives written in other states, as long as they were created according to their originating state’s laws. When authorizing, at least one witness must not be a husband or wife or a blood relative of the principal.